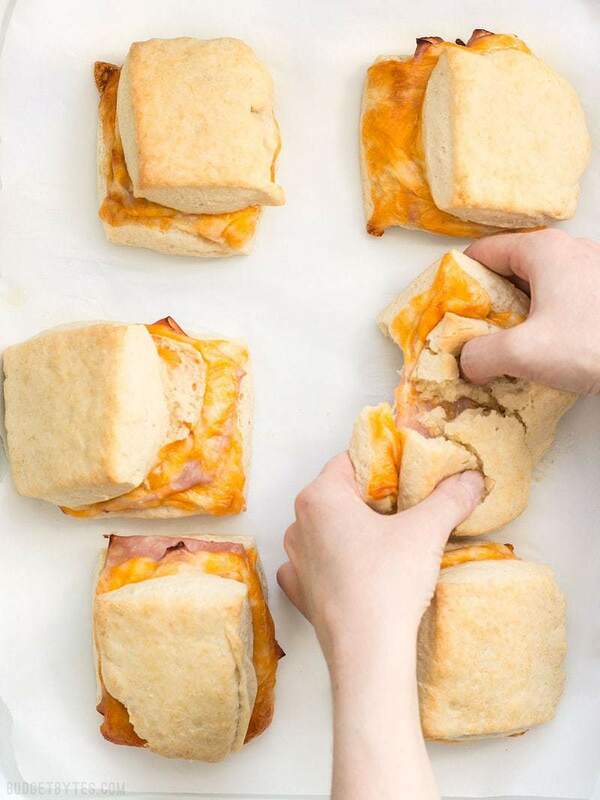 Last weekend my mind drifted to my 5-Ingredient Freezer Biscuits, as it often does on lazy Sunday mornings, and that got me thinking about breakfast sandwiches. It was only a split second before I started to wonder what would happen if I baked a layer of ham and cheese inside my 5-Ingredient Freezer Biscuits. I tested those Ham and Cheese Biscuits idea today and let me just say, best. Idea. Ever. 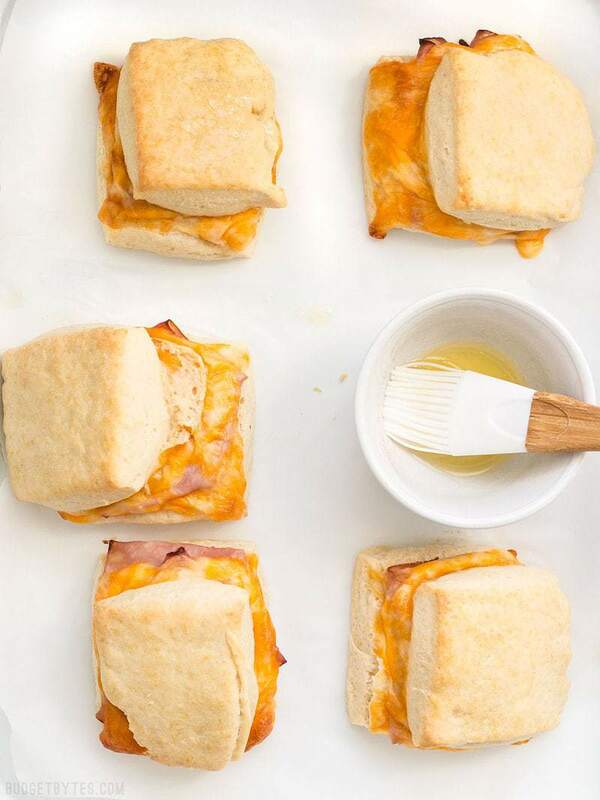 But make no mistake, these breakfast biscuit sandwiches are super rich and indulgent, so save this recipe for a special occasion. While they are delicious, they are not something I could (or would suggest) eating every single day. Just like the original freezer biscuits, I’m sure you could assemble these, freeze them, and then bake one, two, or three as needed straight from the freezer. I haven’t tested any frozen Ham and Cheese Biscuits yet because I just went ahead and baked ’em all today, but just like with the original plain biscuits, they will probably need a few minutes more in the oven when baked from frozen. 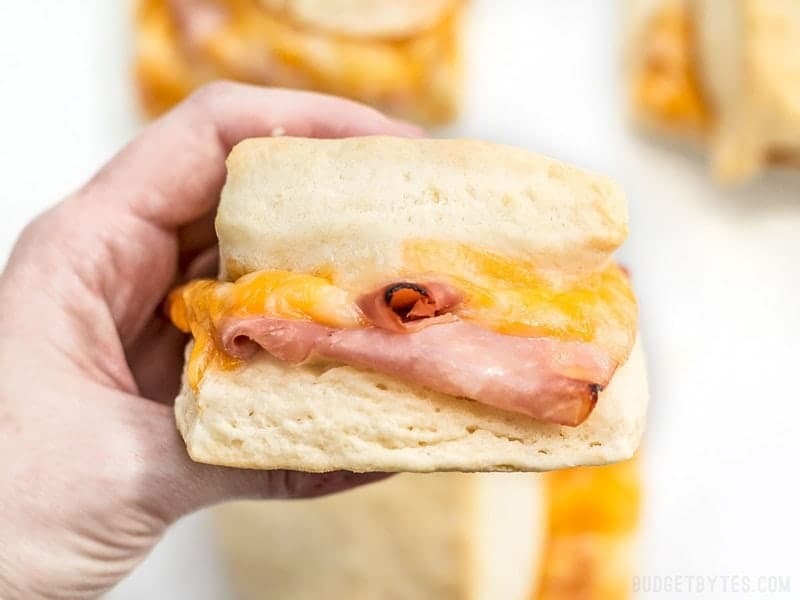 These Ham and Cheese Biscuits are a super indulgent, yet super easy treat for your weekend breakfast or to serve guests. Preheat the oven to 400ºF. 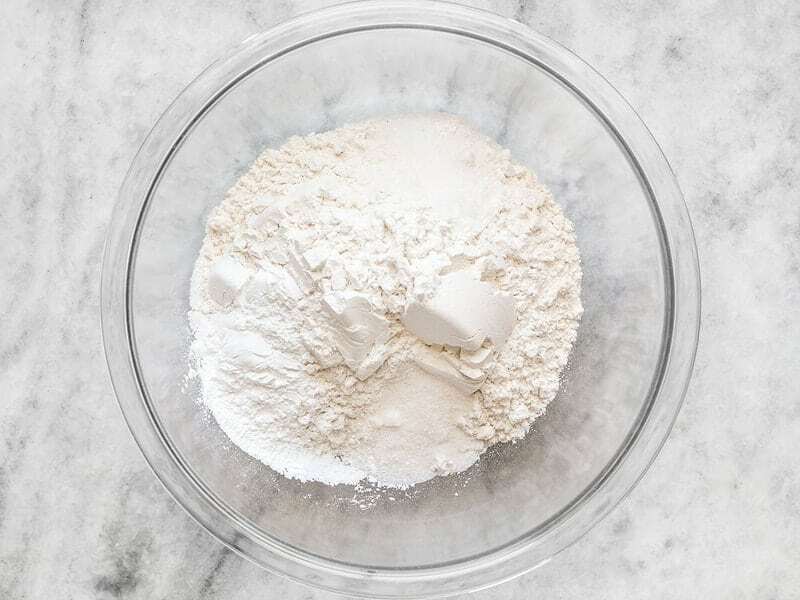 In a large bowl combine the flour, salt, sugar, and baking powder. Stir until they are very well combined. 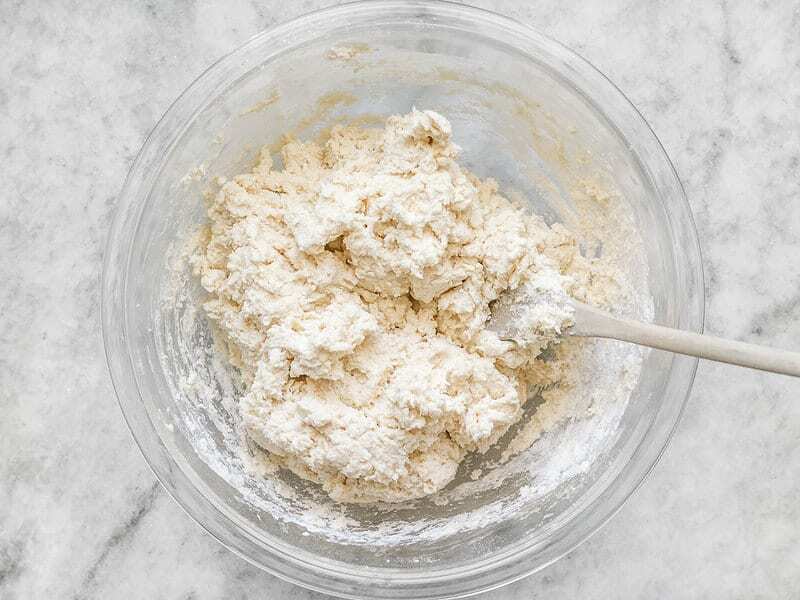 Pour the heavy cream into the bowl and stir until all of the flour is moistened and a thick ball of dough forms. 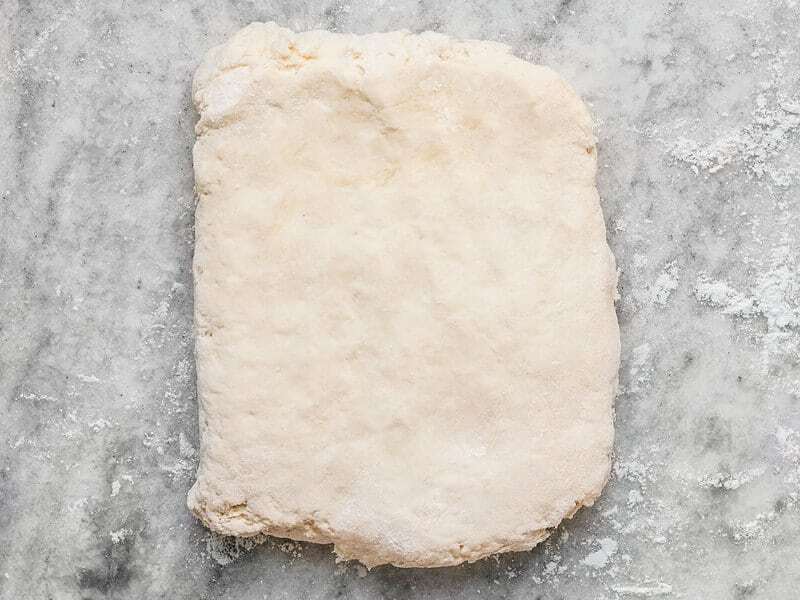 Scrape the biscuit dough out of the bowl onto a well floured surface and press it down into a rough rectangle. 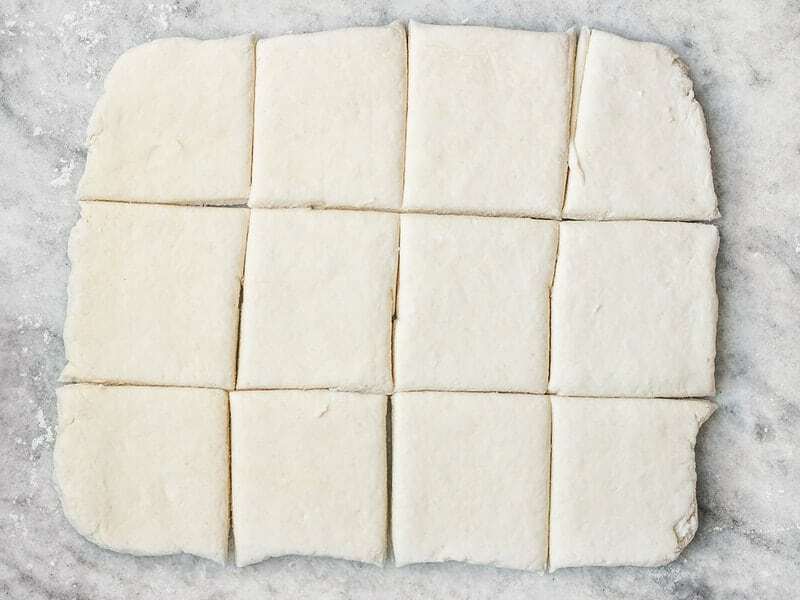 Use a rolling pin to roll the dough out into a rectangle about 8x11 inches and about 1/2-inch thick. Cut the rectangle into 12 pieces. 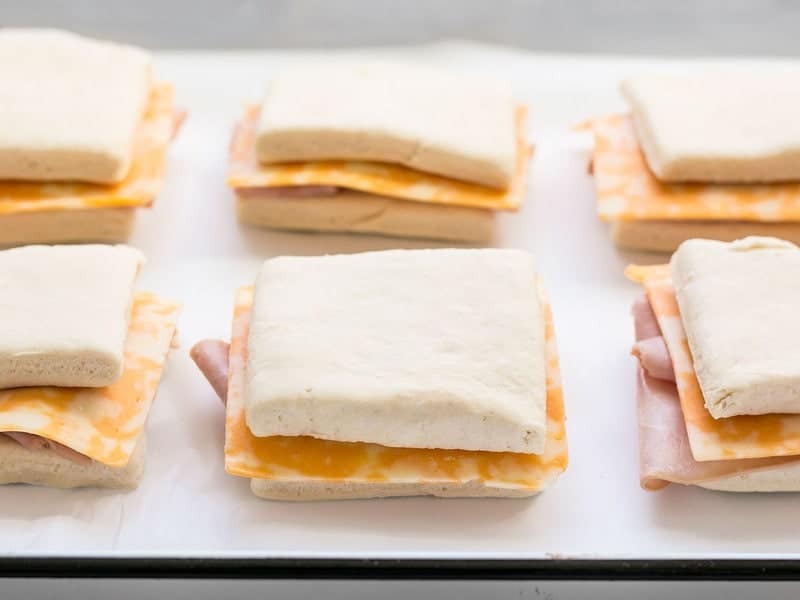 Stack one slice of cheese and two slices of ham onto 6 of the biscuit squares, then top with the remaining 6 biscuit squares. 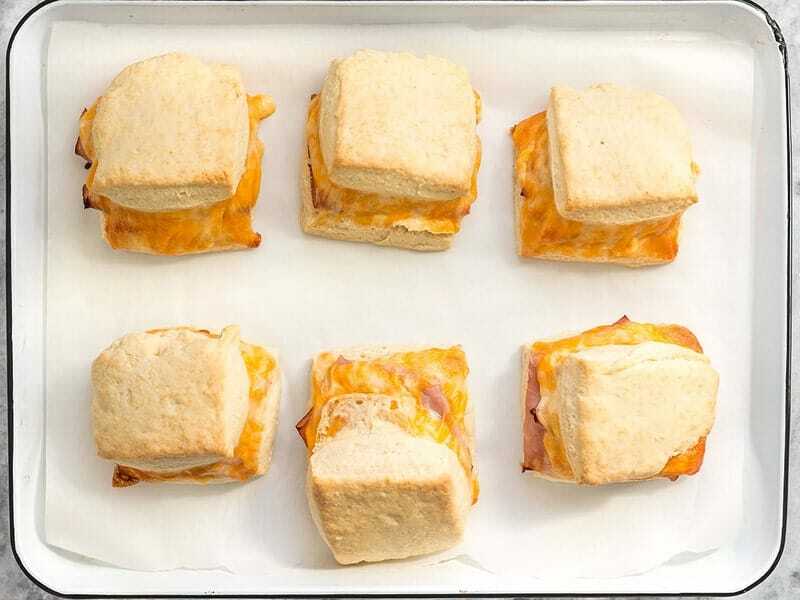 Place the Ham and Cheese Biscuits onto a baking sheet covered in parchment paper and transfer to the preheated oven. 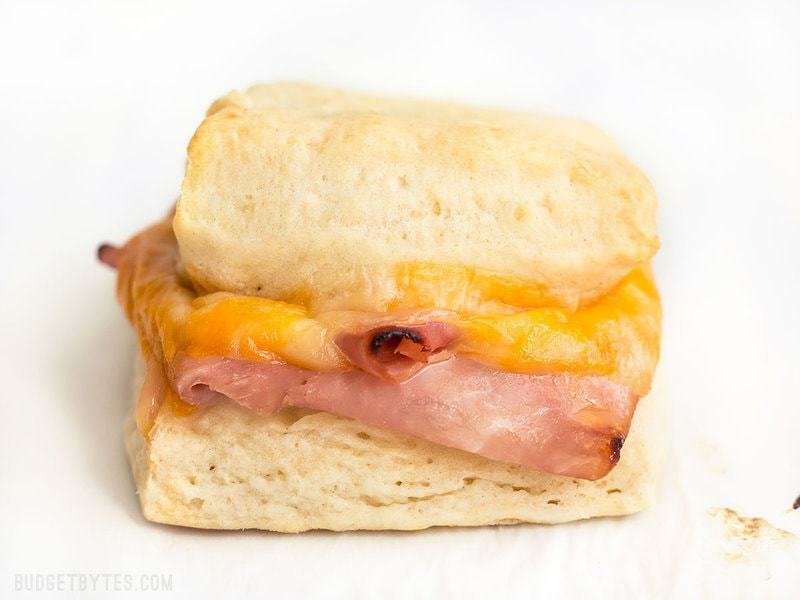 Bake the Ham and Cheese Biscuits for about 25 minutes, or until the biscuits are golden brown on top. Serve hot. *Only heavy cream (35-38% butterfat) can be used for this recipe. Whole milk or half and half will not produce the same results. Preheat the oven to 400ºF. In a large bowl combine 2.5 cups all-purpose flour, 1 tsp salt, 1/2 Tbsp sugar, and 4 tsp baking powder. Stir them together until they are very well combined. 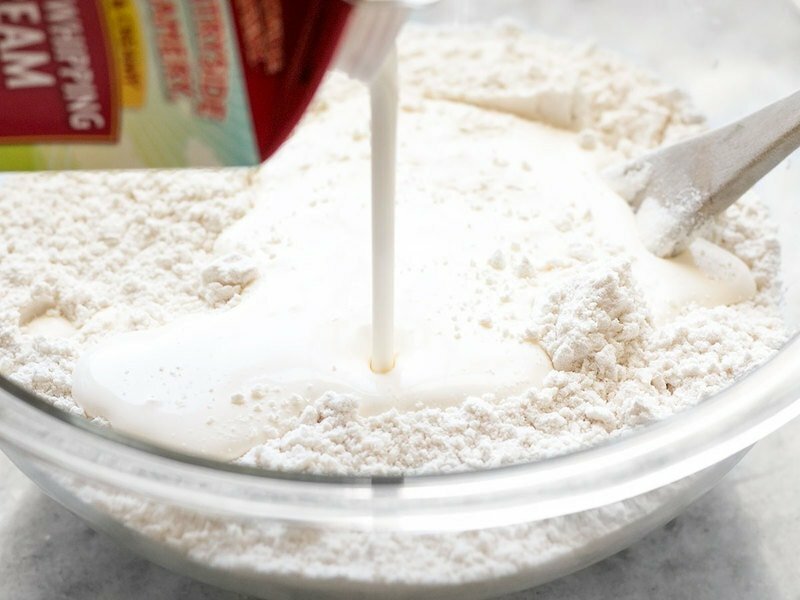 Pour one pint of heavy cream into the flour mixture. Stir until all the flour is moistened and a sticky shaggy dough forms. Turn the dough out onto a well floured surface and press it down into a rough rectangle. Use a rolling pin to roll the dough into a flatter rectangle, about 8×11 inches and about a half inch thick. Use your hands to shape the corners and make the rectangle more even. Cut the rectangle into 12 squares. 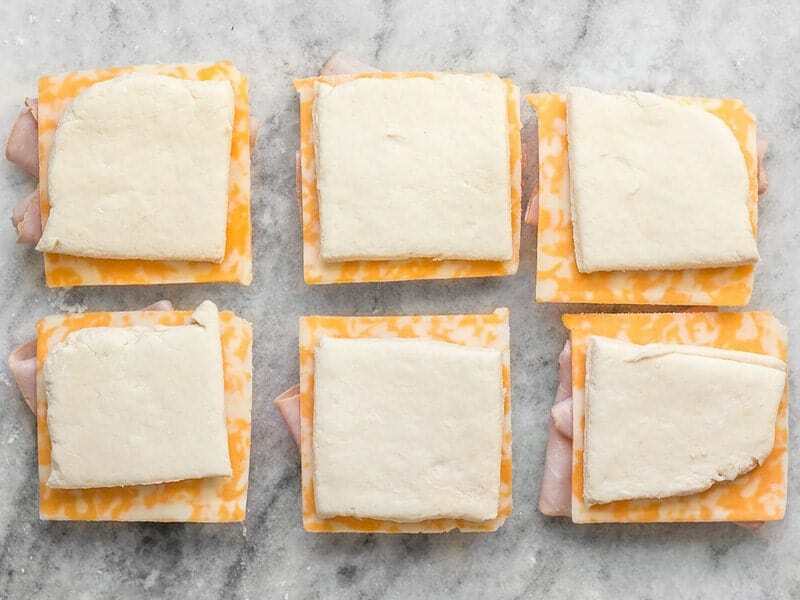 Stack two slices of ham and one slice of cheese on each of six of the squares, then top them with the remaining six squares. Place them on a baking sheet lined with a piece of parchment paper. Here’s the side view so you can see how thick/thin the biscuits were rolled out. They puff up QUITE a bit, so you want them fairly thin. Bake the Ham and Cheese Biscuits in the preheated oven for about 25 minutes, or until they are puffed up and golden brown on top. The total baking time will vary with how thick your biscuits are, so just keep an eye on them. I would start checking at about 15 minutes just to be safe and add 3-5 minutes as needed until they are nice and golden brown on top. These were so good! My top biscuits kept sliding off, too, so next time I’ll try toothpicks like the other reviewer mentioned. Everyone in our family loved them.